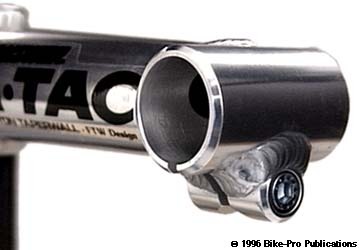 The Answer A-Tac stem is a near all aluminum Mountain Bicycle stem, made to high specifications. The quill tubing is made of 4mm thick aluminum that's cut to give the wedge angle, then pressed hydraulically into the stem body. The stem body, (the part that joins the extension to the quill), appears to machined from aluminum rod. The top of the stem body is bored, from the top, with a 1" diameter hole to a depth of 7/8", this reduces the weight of unnecessary aluminum. On top of this cavity sits a turned aluminum cap piece that closes off the opening and provides a recessed seating for the 8mm x 1.25mm x 145mm long grade 8 heat treated cro-moly expander bolt. The expander bolt with washer weighs 50 grams. The wedge piece for the stem is made of die cast aluminum, which is then tapped with threads for the bolt. The stem extension is made of Easton aluminum with a tapered wall and is TIG welded to the stem body with one single, continuous, beefy weld. The handlebar binder is aluminum tubing cut to length with a hole facing into the extension to release heat at the time of welding. The binder bolt fittings are made of machined aluminum rod that's drilled, leaving a recess for the binder bolt head, then tapped for the bolt threads. The fitting is welded to the bottom of the binder tube. The cinch rod and the binder tube are then sawn through in one smooth cut. The Bicycle stem is heat treated to T6 strength after manufacture. The stem is anodized for a durable finish. The A-Tac stem, which will fit 25.4mm diameter handlebars without a shim or 22.2mm bars with a shim, is made in Blue, Black, Purple, or raw natural Silver. They are made with the quill in 1", 1 1/8", or 1/1/4" diameter, with a reach of 120mm, 135mm or 150mm. The 120mm stem has a 25 degree rise and is available only in Silver. The 135mm stem has a 17.5 degree and is available in Silver, Blue, Black, or Purple. The 150mm stem has a 10 degree rise and is available in Silver. Answer also makes the A-Tac in a 0 degree rise in a 135mm length in Blue, Purple or Silver in all 3 diameters and 150mm lengths in Silver only, but in all three diameters. The Answer A-Tac 135mm with O degree rise in a 1" quill weighs 331 grams. The A-Tac 135mm with 17.5 degree rise in a 1 1/4" also weighs 331 grams. This is achieved by using thinner tubing walls in the larger diameter aluminum tubing. 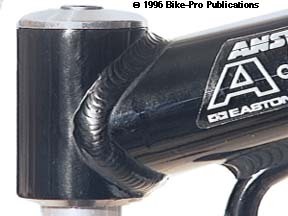 The A-Tac stem is warranted by Answer against bending or failure in off-road use for two full years. 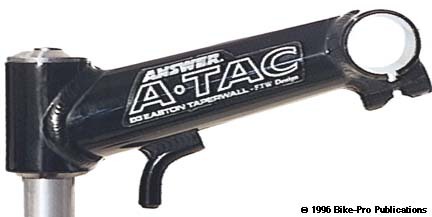 Answer makes a clamp-on version of the A-tac Mountain Bicycle stem. The binder and extension tubes are cut and fastened the same as the standard A-tac. The binder tube that clamps to the fork steerer has a 3mm tubing wall thickness and a 50mm height. Two cinch fittings are used to hold it to the fork that are made and welded like the one on the binder tube. each of the fittings is spaced 12mm from each end of the fork binder tube. All three bolts are the same. The are 6mm x 1mm thread pitch 22mm long, made of steel with a 5mm hex fitting. Each bolt weighs 6.5 grams and could easily be replaced with a 20mm long Ti SRP version. The A-tac Ahead model is made only in Blue, Black, Purple or Silver, with a 0 degree rise, in a 135mm or in Silver only in a 150mm length. The Ahead model is available to fit 1", 1 1/8" or 1 1/4". The weight of a 135mm in a 1 1/4" diameter is 202 grams. 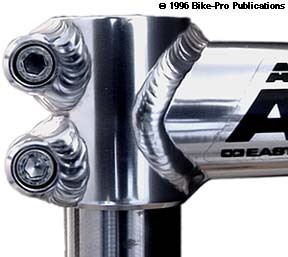 Designed by Doug Bradbury, but manufactured under license by Answer, it is CNC machined from billet aluminum leaving the entire Mountain Bicycle stem a single piece. The piece is complexly cut to shape and height then the bottom of it is machine milled to excavate any part of the aluminum block not required to maintain the structural integrity of the Mountain Bicycle stem. The binder grip area is 47.3mm wide with a 25.4mm hole drilled horizontally through the piece. As the sloping cut is made along the bottom that diminishes the thickness of the stem at the binder, the cut is permitted through to the handlebar grip area, leaving a 3m wide kerf that makes the clamping mechanism. From the bottom a hole is drilled for the binder bolt, which will draw upward the lower clamp jaw. 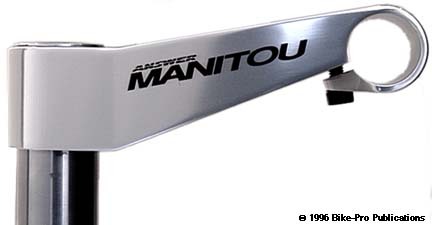 The Manitou stem is an Aheadset variety. 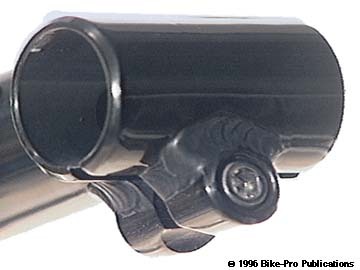 It is held to the steerer tube using two clamp bolts that enter the stem from the right side, just ahead of the steerer. These bolts pass into a recessed area for the bolt head then move through a 6.3mm wide gap cut all the way to within 3mm from the upper surface of the stem The bolts anchor on the far side of the gap into threads tapped into the 15mm thick right side. The Manitou stem comes with mached from aluminum replacement Aheadset cap, to use instead of the plastic one that comes with many Aheadsets. The steel binder bolt has 6mm x 1mm threads, is 20mm long, has a 5mm hex fitting and weighs 6 grams. The clamping bolts are 25mm long versions of the same bolt weighing 7 grams.